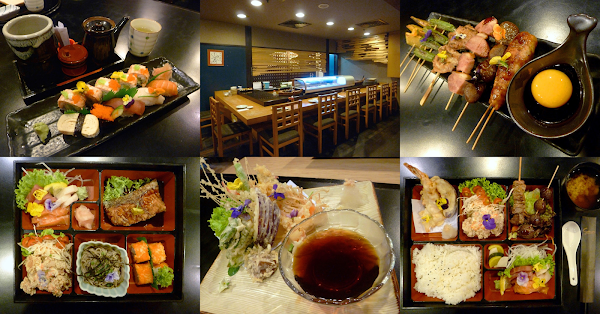 Special thanks to Sango Japanese Restaurant for extending this food review invitation. Crystal Crown Hotel is a 4-star hotel in Petaling Jaya. Tailored for business travelers, the hotel is located near shopping malls like Amcorp Mall and Jaya 33. There are several restaurants inside the hotel, including Sango Japanese Restaurant (珊瑚日本料理) which I am visiting today. Sango is located on Level 2, just across the hallway from the Chinese restaurant. Operating since 1995, the Japanese restaurant has been revamped under new management recently. Just like before, Sango focuses on traditional Japanese cuisine as opposed to Japanese fusion food. Typical of traditional Japanese restaurants, there is a sushi bar where sushi and sashimi are prepared in front of customers. It is not uncommon for the chef and customers to engage in conversations throughout the meal. While the sushi bar is refined in ambience, the teppanyaki (鉄板焼き) section presents a more lively atmosphere. Through the sizzling-hot iron griddle, the performance aspect of teppanyaki is an attraction of its own. In addition, Sango's open kitchen includes a charcoal grill where kushiyaki (串焼き) is prepared. Customers who prefer to dine in a more private setting can request to be seated in the tatami room (和室). The English term refers to any Japanese-style room which has low tables, regardless whether the room uses tatami flooring. Unlike a traditional Japanese home, there is extra legroom under the table so that customers do not need to kneel while dining. Nigiri Sushi Moriawase (握り寿司盛り合わせ, RM75.00) is an assortment of nigirizushi (握り) and makizushi (巻き) garnished with edible flowers. For nigiri, vinegar-laced rice is pressed by hand into clumps, and then covered with toppings like sweet omelette (玉子), fish roe (とびこ), tuna (マグロ), butterfish (イボダイ) and salmon (サケ). As for maki, sushi rice is rolled with ingredients like crab stick (カニカマ), cucumber and omelette. Aburi (炙り) style salmon on top each maki roll is prepared using a butane torch. Meanwhile, Yakitori Omakase (焼き鳥お任せ, RM45.00) is a collection of skewered and grilled foods. "Kushiyaki" is a more general term that is not limited to mere chicken. Examples of skewered foods are chicken meat ball (つくね), duck, lamb rack, shiitake mushrooms (椎茸), okra (lady's fingers) and sweet potato. The dipping sauce is tare (たれ) with raw egg. Tempura Moriawase (天ぷら盛り合わせ, RM33.00) includes shrimps, dory fish, mushrooms, eggplant (brinjal), okra, green beans, pumpkin, carrots and rice noodle. Tempura is prepared by coating each piece of food in cold batter, and then frying it in hot oil until the outer surface becomes fluffy. Grated daikon (大根) and tentsuyu sauce (天つゆ) are typically served alongside tempura. Moving on to proper meals, Sango Bento (珊瑚弁当, RM51.00) features salmon teppanyaki (サーモンの照り焼き) glazed in sweet-salty teriyaki sauce. In Japan, shioyaki (塩焼き) is generally preferred over teriyaki because the former keeps the fish's flavor unaltered. Another notable highlight is a crispy piece of fried chicken (鳥唐揚げ). Besides salad dressing, the chicken is also served with shredded cabbage and cherry tomatoes. Meanwhile, zaru soba (笊蕎麦) is served with soba tsuyu (蕎麦つゆ), a dipping sauce based on dashi (出汁) and soy sauce (醤油). Made from buckwheat flour, soba has rougher texture than ramen or udon. The chilled noodle is topped with strips of seaweed (海苔) and chopped scallion. Sango Bento includes salmon, tuna and butterfish sashimi (刺身) - 3 slices each. Lemon, wasabi (山葵) and pickled ginger (ガリ) serve as condiments. Also included are several pieces of maki sushi. Like Sango Bento, the Fuji Bento (富士弁当, RM51.00) includes fried chicken and sashimi. In addition, the bento set also comprises of tempura, kushiyaki, steamed rice and miso soup (味噌汁). Fuji Bento's kushiyaki consists of two skewers: lean chicken (正肉) and shiitake mushrooms. The skewers are dressed in sweet-savory teriyaki sauce. Baked Oyster In Foil (焼き牡蠣, RM35.00) is not listed on the regular menu and only available upon request. The five oysters are baked in aluminium foil to prevent them from losing too much moisture. Savory sauce is used as seasoning. Alcoholic beverages at Sango Japanese Restaurant include Japanese liquor (焼酎), red wine, white wine and beer. It is also common for regular customers to leave their liquor at the restaurant for future visits. Directions: Crystal Crown Hotel is located on the right side of the one-way Jalan Utara, approximately 400 meters after the junction with Jalan Semangat. Sango is located on Level 2. There are parking spaces at the basement levels of the hotel. The parking rate is RM5.00 for the first 8 hours and RM1.00 for each subsequent hour.